During the school week, I've gotten in a really bad habit of starting my homework way too late at night and then not getting to bed until 12 or 12:30. I'm someone who needs a lot of sleep in order to function, and this bad habit of mine is really starting to drag me down! After Spring Break, I'm really going to work on getting my work done earlier in the night so that I have more time to relax before bed. However, that also leads me to the problem of Netflix (aka the infamous time sucker). 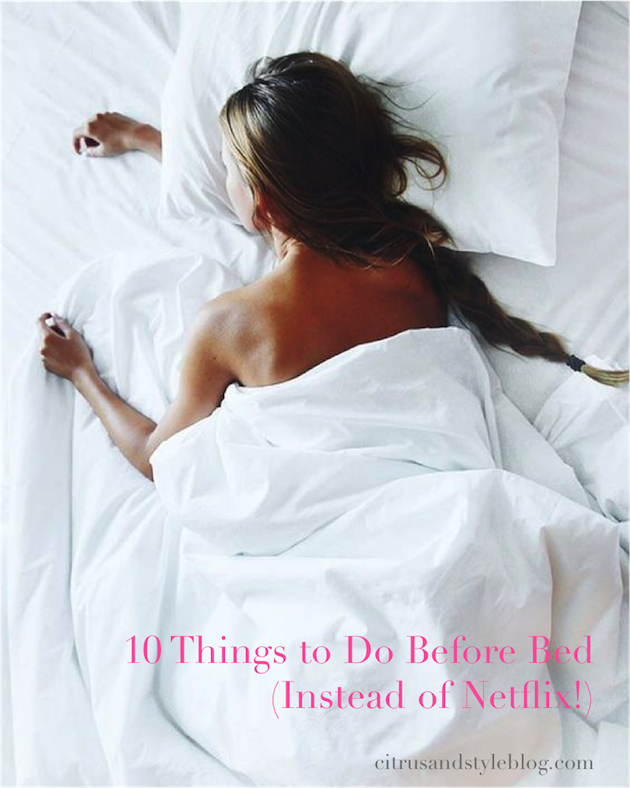 Rather than binging on New Girl into the wee hours of the morning, I've come up with 10 things to do before bed to ensure that you will actually get to bed at a reasonable time. These things don't involve any electronics, so your body won't be distracted by the blue light. Basically, they're productive, fun and will tire you out so you have an easier time falling asleep! I have been dying to get my hands on an adult coloring book ever since they became popular - they look like such a fun way to get a little creative and zone out. I really want to buy this garden one or this pattern one. To unwind, there's nothing better than curling up with a book you love. I received the new Kate Hudson book for my birthday and it's my favorite thing to page through before I fall asleep. For my trip, I picked up Prep by Curtis Sittenfeld and am loving it so far! Stretching out your body before you fall asleep is really important. This sequence of poses is perfect to do before you hop into bed. I always feel 100x better when I go to bed knowing that I have a list of things I need to accomplish the next day. The worst feeling is having a lot of things on your mind that you're scared you'll forget to do, so write it all down and you'll fall asleep much more easily. A great time saver for the morning, setting out your outfit for the next day will relieve you of the stress of deciding what to wear in advance. 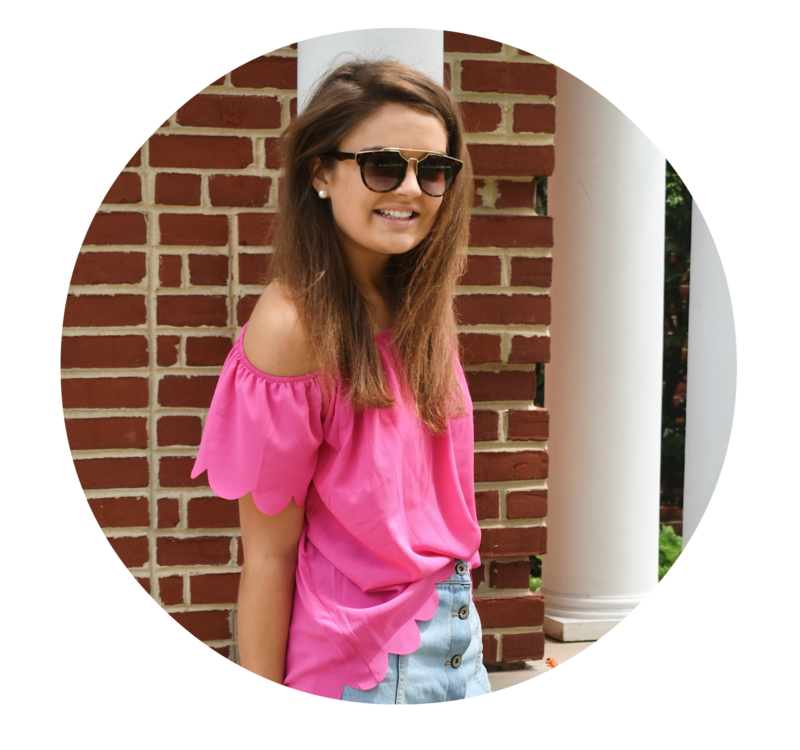 I rarely go to bed without choosing my outfit now - it makes a much bigger difference than you think! Whether you write down all your thoughts, goals or ideas, journaling a bit is a really therapeutic way to clear your head. I've been making monthly lists of my goals and set them next to my bed to look over and add to the list when I think of it. One of my personal favorites, taking a bubble bath or shower right before bed is so amazing, especially if you get really cold at night like I do. Add your favorite scented bubble bath, light a few candles and relax for a few minutes to calm you down for the night. If you're someone who likes to clean at night (like me), pick a part of your room and organize it before you go to sleep. I can never go to bed without picking up any clothes on my floor, and have gotten in the habit of cleaning off my desk before bed as well. This way, you go to bed feeling really accomplished and ready to take on the next day. A fun game that is available in books or on your phone, Sudoku always tires out my brain but is still fun to play. It gets you thinking but is also sort of a peaceful way to end your night. Before you fall asleep, plan out what you're going to eat for breakfast the next morning. You could prepare all of your contents for a smoothie, set out a granola bar or take out your favorite box of cereal to make your morning go more smoothly. Please tell me I'm not the only one trying to steer away from Netflix before bed! Awesome list! I actually do a lot of these things before I go to bed (...sometimes along with netflix, ha!). I generally end my night with a book since I found that technology right before bed usually makes falling asleep much harder. I love to have my room organized, clean and ready for the next day - so this is one of my favorite ways to unwind and power down all of the electronics! If I finish that and still can't sleep, a book is my next go-to. This is a great list!